I’ve been reading a lot lately about other creatives and their process. It’s “funny”, typically, everything they say resonates. My process usually mirrors theirs, I’ve just never put words to it. 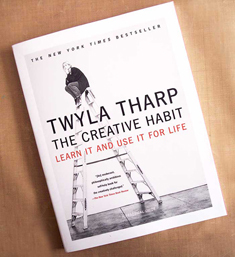 The Creative Habit was written by Twyla Tharp. She’s a famous choreographer in New York and has worked on a stupid number of shows and even won a couple of Tony’s (no big ). Even though what I do, is far removed from dance, our processes are still very similar. She spends a whole chapter talking about scratching. You know how you scratch away at a lottery ticket to see if you’ve won? That’s what I’m doing when I begin a piece. I’m digging through everything to find something. It’s like clawing at the side of a mountain to get a toehold, a grip, and some sort of traction to keep moving forward and onward….Scratching can look like borrowing or appropriating, but it’s an essential part of creativity. She goes on to quote a Harvard psychologist who claims there are four ways ideas can be acted upon. First, you must generate the idea, usually from memory or experience or activity. Then, you have to retain it–that is hold it steady in your mind and keep it from disappearing. Then, you have to inspect it–study it and make inferences about it. Finally, you have to be able to transform it–alter it in some way to suit your higher purposes. I do this. I scratch through the internet, looking through dozens of RSS feeds in Google Reader. I scratch through Dribbble, Twitter, and Flickr looking for something, anything. Then, when I find something, I retain it, by putting it in Evernote. I’ve told you before, I have over 15,000 notes in Evernote. This is why. I also carry around a moleskine. They might be meaningless to one person, but they hold priceless gems to me. Everytime I get ready to start a project, I go back through my Evernote account, inspecting. At this point, I’ll usually make a mood board for my clients, pulling ideas that are relevant to their project. When I get ready to push pixels, I begin to transform those ideas into something that is (hopefully) new and unique. Twyla Tharp was right. Creativity is a habit. I have to constantly be collecting…err… scratching, so that when the moment comes when I have to produce, I have something to pull from.